I’ve long been at odds with myself as to which rums I should review, and which ones I shouldn’t. It used to be that I only reviewed rums that I considered to be “sippers,” being as flavored mixing rums are too difficult to seperate from the quality of the mixed drink itself (seriously, even a simple rum&coke is far more forgiving of a rot rum than would be that rot rum by itself.) But here and there I’d find a rum that wasn’t really a sipper, but still warranted comment of some kind. And then a lovely package from Three-D Spirits arrives at my doorstep containing not one but three mixer rums. I mean, they made the effort to send it, the least I can do is offer comment, aye? Having run the gauntlet with all three rums, I’d say that any would make a decent mixer or even a surprisingly gentle shot, but none is something I’d recommend in a snifter or mug by itself – but that’s no different than the majority of their flavored Malibu, Bacardi, or Cruzan competitors. I began with Jolly Roger Coconut & Key Lime Rum, which comes packaged in Three-D’s distinctive coffin-shaped bottle. I’ve seen plenty of coconut rums before, as well as lime rums, but I don’t know that I’ve often found both in a single rum, so that’s definitely a fun twist. In the glass, Jolly Roger is clear, and smells of coconut and lime, along with a definite dose of alcohol. To the taste Jolly Roger is much the same, although the alcohol is far more subdued than I’d have expected – it actually reminds me of one of those gently flavored mineral waters that were so big in the 80’s. Next I tried Redrum, which purports to be a blend of “Premium Caribbean Rum & Natural Tropical Flavors.” This time the rum smelled fruity and candy-like, although distinguishing individual fruits is a bit difficult – it’s more like that all-encompassing fruity smell of tropical punch. To the taste Redrum is again surprisingly gentle, although a bit cough mediciny for my taste. Last up was Voodoo Spiced Rum. It’s actually my belief that my receiving of this rum package was in direct response to my favorable opinions of Kilo Kai, and more recently Kraken spiced rums, both of which have handily raised the bar for spiced rum everywhere, and truly achieved the level of premium, sippable spiced rums. Voodoo, however, just doesn’t measure up in this regard. It smells of vanilla and faintly of spices, but they only barely mask the alcohol. On tasting, Voodoo is light and tingly, but tastes very much of bargain mixer rum with a spicy finish. Of the three, I think Jolly Roger and Redrum could certainly have a place amongst any basic mixologists cabinet – both offer some unique flavor combinations, are surprisingly easy on the gullet, and could give that perfect kick to your fruity concoctions. 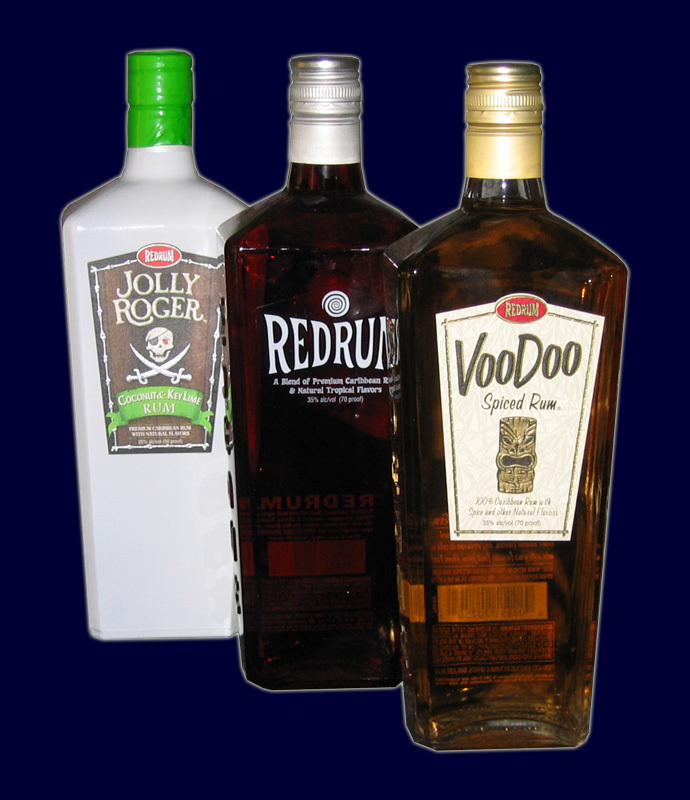 Voodoo could also nicely serve for a basic mixer spiced, although unlike its two peers it offers little to set it apart from the vast array of basic spiced mixers that are also available these days. This entry was posted in Rum and tagged jolly roger rum, mixer rum, redrum, spiced rum, three-d, voodoo rum by Bilgemunky. Bookmark the permalink. Much better to mix yer own – or spice yer own! Mixing fresh Coconut water with a good Rum is Pyrate-y goodness. Want spice? A couple of freshly dried hot peppers, clove or two of…umm…clove – season to taste with some ground dark natural chocolate (at least 70-80% cacao)…even a pinch o’ natural peppermint…let “steep” for at least a week. I thinks I need to “acquire” a bottle o’ Jolly Roger. I do like all things lime, an’ coconut is always good.